Who couldn’t love a tiny, shy marine mammal nicknamed “the little sea cow,” that wears mascara and lipstick, and has an eternal smile? Us humans, apparently. The most endangered marine mammal in the world lives only about a four-hour drive south of metro Phoenix, in the Sea of Cortez (“home to a third of all marine mammal species in the world” according to CBS) between mainland Mexico and Baja California. I began this article a couple of years ago, and didn’t realize that the CBS series “60 Minutes” was working on a segment about the “vaquita marina,” or just “vaquita,” at the same time. I happened to see the segment playing on a waiting room monitor this afternoon, which caused me to retrieve and dust off my draft. 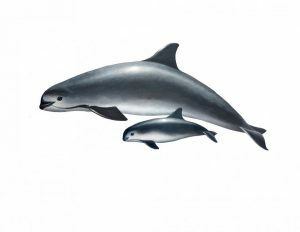 Most of the vaquita have been killed as by-catch in gill nets used by legitimate fishermen, and by poachers chasing an endangered fish, the toboaba; which is killed for its swim bladder. The organ is cut out of the fish, and sold to Asian markets for supposed medicinal value, while the rest of the fish is discarded back into the ocean. At the time the video was produced, it was estimated that fewer than 60 vaquita remained. That number is likely below the level of “genetic bottleneck” (too little genetic diversity remains within the population for survival of the species), so drastic measures are needed. and to read the information at the sites below.